“Trust a Mur­ray to keep score,” Jamie said, shak­ing his head. 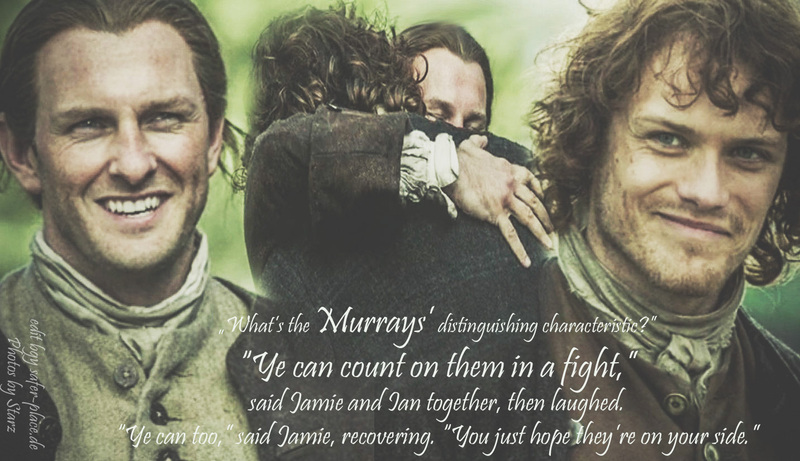 “Ye can count on them in a fight,” said Jamie and Ian togeth­er, then laughed. “Ye can too,” said Jamie, recov­er­ing. “You just hope they’re on your side.” And both men went off into fits again. Quo­te and Excerpt by Diana Gabal­don. It was an amaz­ing sto­ry line through out the movie. I loved it, and the love sto­ry between claire and jamie was mag­i­cal. then bring­ing jamie back home to his fam­i­ly and friends was nice and see­ing rela­tion­ship with his child­hood friend ian was pret­ty cool. Of course the end­ing was heart wrench­ing, but that was some of the best work I have seen in actors in a long time. Also its the best script writ­ing I’ve seen in a very long time con­grat­u­la­tions on your hard work!